AACEA Oregon: Series - Most Common Oregon Liquor Licenses: Learn About the Full On-Premises Sales (F) License! If you’re planning to open up an establishment that will sell or serve alcohol, you’re going to want to know which Oregon Liquor License will suit your vision best before beginning the application process! We're putting together a series about various OLCC Liquor Licenses, but in this post we’re going to specifically talk about the Full On-Premises Sales (F) License. Question: What sort of establishment would a Full On-Premises Sales (F) License be best for? Answer: Full On-Premises Sales (F) Licenses work well for fine dining restaurants, neighborhood/family restaurants, nightclubs, hotels, and private clubs. The F license is great for establishments that plan to sell hard liquor (distilled spirits), beer, wine, and cider by the drink for customers to consume within the grounds of the establishment. In other words, this license does not permit your customers to take drinks to go UNLESS your business also has an Off-On-Premises Sales license. Your customers can take a partially consumed bottle of wine home with them if it was served during their meal. Your customers can purchase beer to take home with them as long as it is dispensed in a securely covered container (growler) that the customer provides. AACEA Washington: What Are Acceptable Forms of Identification For Alcohol Sales & Service In Washington State? It is guaranteed that if you serve or sell alcohol in Washington State you’re going to find yourself checking a whole lotta IDs! This means you’re going to come across several different styles of IDs, but not all IDs are acceptable to use for alcohol transactions. The first step you’ll need to take when a customer hands you their ID is to make sure it is considered an acceptable form of identification per the Washington State Liquor Control Board (WSLCB) for confirming someone’s age. This is important, because if you accept and check an unacceptable form of ID for someone and then serve or sell them alcohol you can get in BIG trouble! Especially if you find out that person deceived you and was not actually 21 or older! AACEA Arizona: Arizona Must-Know Alcohol Laws - Simplified! Arizonians! If you are a bartender, server, or manager who oversees employees who engage in alcohol transactions, or if you’re planning to enter the hospitality industry in Arizona, you’re going to need to know Arizona’s alcohol laws and adhere to them while on the job. Likewise, if you are a customer who wants to engage in drinking festivities within Arizona State, these basic laws will be beneficial for you to know. How old do I need to be in Arizona State to bartend? 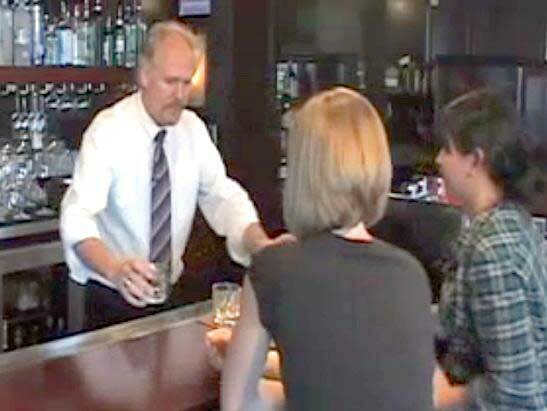 How old do I need to be in Arizona State to serve alcohol as waitstaff? How old do I need to be in Arizona State to conduct alcohol tastings? How old do I need to be in Arizona State to enter a bar? AACEA Ohio: Basic Ohio Alcohol Serving Laws Every Server Should Know! Ohio State does not require that alcohol servers (bartenders, waitstaff, etc.) or alcohol sellers (liquor store staff, grocery store staff, etc.) take a Responsible Alcohol Sales & Service course and receive a certificate, however, the Ohio Department of Liquor Control does still require all employees who are involved in alcohol transactions with customers to know and adhere to Ohio State Liquor Laws. We have curated the top must-know Ohio Alcohol Laws below for your reference! How old do I need to be in Ohio State to bartend? How old do I need to be in Ohio State to serve alcohol as waitstaff? How old do I need to be in Ohio State to conduct alcohol tastings? How old do I need to be in Ohio State to enter a bar? Varies The answer to this question oftentimes varies depending on the establishment. Some establishments only allow individuals who are 21 or older to enter, while others allow individuals who are at least 18 to enter. Some establishments even allow individuals who are under 18 to enter if they are accompanied by a legal parent or guardian who is 21 or older. AACEA Montana: Basic Montana Alcohol Laws You Should Know! Are you curious about Montana’s alcohol laws? Perhaps you work in the hospitality industry or are planning to begin working for the hospitality industry in Montana State and could use this information to expand your knowledge for your job. Or maybe you’re visiting Montana (or are planning to visit) and would like to know Montana drinking laws ahead of time. Whatever the reason may be, we have provided some of the most basic Montana alcohol laws below for your reference! How old do I need to be in Montana State to bartend? How old do I need to be in Montana State to serve alcohol as waitstaff? How old do I need to be in Montana State to conduct alcohol tastings? How old do I need to be in Montana State to enter a bar? Varies The answer to this question varies depending on the establishment. Some establishments only allow individuals who are 21 or older to enter. Some establishments allow individuals who are at least 18 to enter, and other establishments allow individuals who are under 18 to enter if they are with their adult (over 21) parent or guardian. AACEA Oregon: Must-Know Oregon State Alcohol Laws – Simplified! AACEA Washington: Basic Washington State Alcohol Laws You Need To Know! AACEA Louisiana: Liquor Permit Requirements – Which Alcohol Permit Do I Need To Get For My Business?